Lots of my followers have asked me about HIIT (high intensity interval training), which I've mentioned in other posts. I love HIIT workouts! They're intense and quick. Think: jumping jacks for 1 minute, with 30 seconds of rest, then 1 minute of burpees, with 30 seconds of rest, etc., for 20 to 30 minutes. But is HIIT really more effective than spending hours in the gym or long-distance, steady-state running? I think so! And I found a little infographic to help prove it. Some of this info is very scientific about how your body responds to intense activity, but the most important part (to me, anyway) is that, "Studies show that 27 minutes of HIIT 3X/week produces the SAME anaerobic and aerobic improvement as 60 minutes of cardio 5X/week." Umm, if only 27 minutes of HIIT, three times per week (81 minutes total) is equivalent to 60 minutes of cardio, five times per week (300 minutes total), who would want to waste that extra time slaving away with unneeded cardio? Not me! I used to do a lot of steady-state running - running at a steady pace for an extended period. I thought I was really doing something, too. I was able to build up to running 3, 5, and more miles at a time. But then I started to see more and more HIIT workouts on Pinterest and fitness blogs. So I decided to give it a whirl. Let me tell you, my workouts have never been better, and I've never felt better! I incorporate weight lifting/strength training with the HIIT too. I get the same euphoric feeling in 20 minutes of a good HIIT workout as I did with an hour of running. If you've never tried HIIT, you should! You can find some of my favorite fitness/HIIT bloggers here: Throwback Workout Roundup. And here are some Instagram accounts to follow for HIIT inspiration: Instagram Fitness Roundup. Need some great beginner HIIT routines that can be done anywhere with minimal equipment? Check out this article from FitFluential: 15 HIIT and Tabata Workouts. 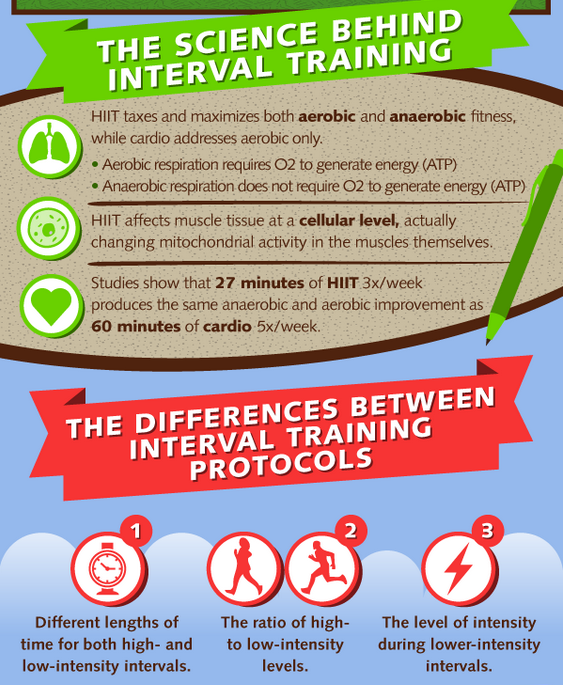 Below is the complete infographic about interval training and how wonderful it is for your body. It also explains the different types of interval training, and provides sources for the science behind it all. Please take a moment and check it out! I've wondered about HIIT. I'm glad I stopped by from the link up today so I could learn more about it! Love the graphics! provided much insight that I was already curious about. Thanks for sharing. Thanks! Glad it cleared some things up for you. I think HIIT is talked about a lot, but not really explained. Thanks for stopping by!! I did not realize 30 min of HIIT was the same as 60 min of cardio! That is amazing, I am glad I did a HIIT exercise today!